The aroma of simmering curry is inviting, and I find resistance futile, even on a blistering hot day. After ordering a lunch set at Gaylord Tarumi, I ordered a Cobra beer — brewed in the UK and exclusively distributed in Japan by Gaylord — to soothe my taste buds while eating the channa curry. Especially brewed for imbibing with spicy Indian cuisine, this beer is smooth and has little gas. The light, refreshing taste is popular in Japan with women, but it doesn’t hit the spot for some men. My lunch set came with two flavours of succulent chicken tikka — my mark of a good Indian restaurant. 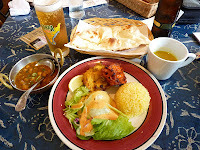 “There are many Indian restaurants in every city across Japan, today, competing with each other. We differentiate ourselves by focusing on quality,” says Hiromi Sakata from Gaylord. “We use only fresh locally produced chicken, fruit and vegetables from Hyogo Prefecture to create the delicious curries and other dishes.” Therefore decreasing their ecological footprint. The Australian and New Zealand lamb and mutton is halal. The adventurous diner can create their own curry for ¥1,800, by choosing one of seven base sauces, including Masala (onion), Makhanwala (tomato and cream), Sagwala (spinach) and Khorma (nuts and cream), and one of the various main ingredients. Premier, international Indian restaurant chain, Gaylord, opened its first Japan branch in 1973 to serve the local Kobe Indian community, when Kobe had no Indian restaurants. 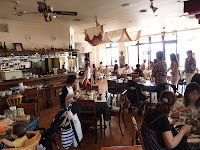 They now run two restaurants in Kobe: Sannomiya and Tarumi (Marine Pier). The sets offered at both branches differ to cater for different clientele; the Sannomiya branch has business clientele, and the Tarumi branch, shoppers and families. Visit the Tarumi branch, which has parking, at night and enjoy the spectacular view of the illuminated Akashi Ohashi bridge. If you are going to the Sannomiya branch with a group for dinner, Sakata-san recommends you book, because it is smaller than the Tarumi branch. With the recent boom in Indian restaurants around the country, Gaylord decided to concentrate more on serving restaurant-quality food to customers around the country. Even though Gaylord offers takeaways from their menu, diners wanted to enjoy the curries at home without having to visit the restaurant. So, in consultation with department store and supermarket buyers, they created a range of five ready-to-eat curries made from original recipes — beef, chicken, keema, scallop and tomato. They also package two varieties of curry roux. By offering these through retail outlets and their online shop, Gaylord “wants to create a system where people around Japan can enjoy the same Gaylord quality curries at home.” Quality also means pricey. The staff realise their products are more expensive than their competitors, but they are not willing to sacrifice quality for price. “Gaylord offers premium food with the emphasis on safety, reliability and a commitment to quality.” All ingredients in their line-up are specially selected, as they are in the restaurants. Open: 11:30am–3pm (lunch), 3pm–4:30pm (tea time), 5pm–9pm (dinner). Text & Photos: George Bourdaniotis. Originally published in Kansai Scene #136, September 2011.